Someone recently asked me how we can possibly choose a player of the year. Well, there is no exact science and we had several recommended players who had tremendous years. But it is not all about wins and losses. We wanted to recognize not only a great player, but a great person too. Our Pickleball Rocks Player of the Year, is mentioned a lot amongst our 6000 Facebook friends. He is described by everyone as a kind, likeable person who is generous with his time and goes out of his way to make people feel good. 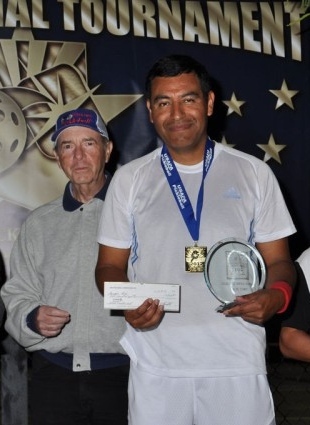 He also happened to have a dynamite tournament year as he won numerous pickleball tournaments including both the prestigious Open Singles and Open Doubles titles at the 2012 USAPA National Tournament. This year’s Pickleball Rocks Player of the Year is Enrique Ruiz. He is a true ambassador of our sport. We’re proud to call him our friend. Personal Pickleball Coaching is Here!!! The press release went out today. We are proud to announce our new sponsorship of Prem Carnot and PickleballHelp.com. 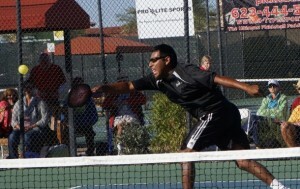 Prem, like ourselves, is passionate about the game of pickleball. He has been a fanatical player and tournament winner for years. Lately, Prem has been passing on his experience and vast knowledge of the game to others, through live lessons and clinics in the San Diego area. Now he has taken his unique ability to help others with their game to a new level with the launching of PickleballHelp.com. 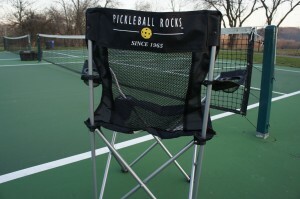 As everyone knows, our mission at PickleballRocks.com and AllAboutPickleball.com is to grow the sport of pickleball in any way we can. Obviously if players feel like they are continually improving, they will be even more inclined to stick with it and of course tell others. This ability to help players get better is what Prem Carnot brings to the national pickleball community. PickleballHelp.com allows any player, anywhere, to be able to get top level help, advice and guidance from one of the most recognizable names in the sport. Prem Carnot and his wife Wendy have played all over the country and tirelessly promote pickleball everywhere they go. Besides our long time USAPA sponsorship, this is our most exciting sponsorship ever. At Pickleball Rocks, we recognized, as with any sport, it can be frustrating when you try to play but things don’t go your way. Prem Carnot is going to help eliminate that frustration for both new and old pickleball players. Like every good teaching pro, Prem has the ability to look at your game and help make you better in a hurry. We love Prem’s passion for the game and are happy to promote and recommend Prem Carnot’s pickleball coaching to everyone. And as alway, PICKLEBALL ROCKS! I know that is a sad title to a blog post. And yes, my birthday is celebrated every year around Thanksgiving so they always make sure I get a huge, delicious meal. And yes, Christmas is coming and I do understand and promote the real reason for the season. So you would think this would be a special time of the year. But NO, it is a time of sadness. The court chairs look lonely. The pickleball courts here in the midwest are empty. The wonderful, daily sound of pickleballs popping off the paddles is gone. It is getting dark so early that most guys and gals can’t get to the courts after work. It is getting so cold (today was a nice exception) that bulky coats are quickly becoming an outdoor necessity. And the real problem is we can’t find an indoor place to play this time of year. We live in Indiana where of course basketball is king. Every boy and girl from the 5th grade through high school is practicing and playing basketball daily. The gyms are all occupied seemingly 24 hours a day from now until towards the end of January. Then things will look brighter. We will be able to secure some indoor time, hopefully at our local high school where there is room in the practice gym for 4 temporary pickleball courts. Tell us where you are playing indoors this winter?